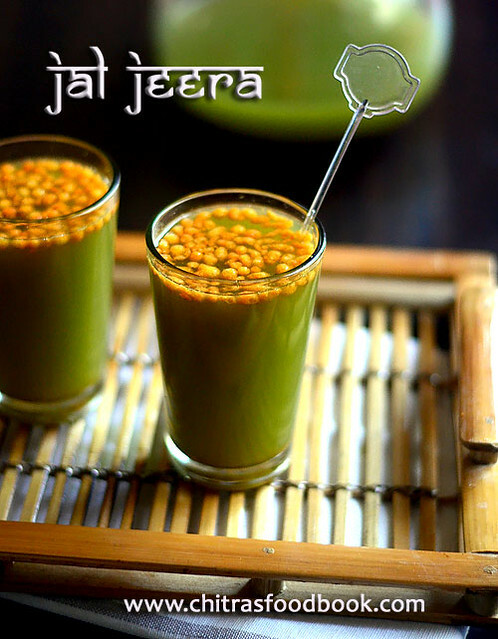 Jal Jeera / Jaljira is a healthy summer drink that is most popular in North India. In Hindi, Jal means water and Jeera means cumin seeds. This drink is prepared with special spice mix masala powder that is mixed with water or soda. Jal jeera spice powder is made of roasted cumin, pepper, mint leaves, black salt, ginger, amchoor powder and lemon juice. So it has lots of health benefits. Basically it helps to improve digestion and aids for weight loss too. I have tasted this jaljira several times in “The Village” restaurant and in some other hotels as well. Mostly it is served as an appetizer in restaurants whereas I like to have this drink after a heavy meal. I love this drink very much and I don’t mind drinking at any time or any season of the year . So I bought a packet of jaljeera powder from the shop and prepared this drink at home for the first time. We loved it very much. Then I started serving this to my guests as a welcome drink. Everybody liked it so much and asked me the recipe too . Even though I make it with store bought powder, I used to tell the ingredients roughly and ask them to buy this jal jeera powder from the market . 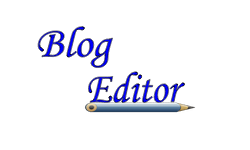 Yesterday I was thinking to start summer recipes in my blog. 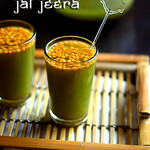 The most refreshing summer drink jaljeera flashed in my mind. 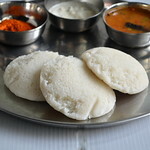 I tried it this morning by watching Sanjeev Kapoor’s YouTube video and made it from scratch. I altered the recipe slightly by looking at the ingredients list of store bought jaljira packet. It came out very well and tasty. Traditionally tamarind is used in jaljeera but have used lemon juice instead. 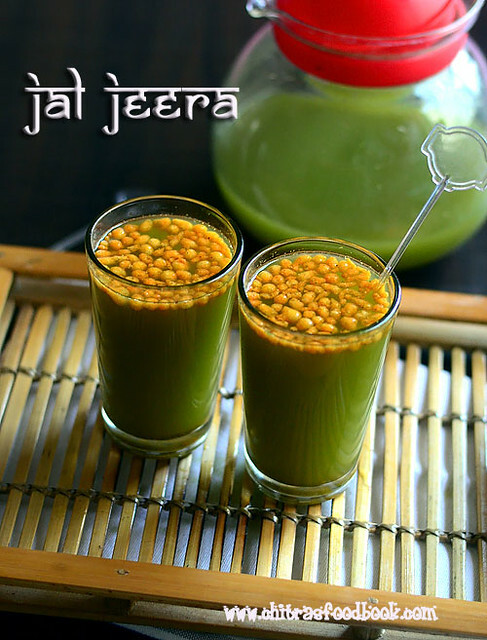 So lets check how to make this refreshing, fresh, yummy, healthy, easy Indian drink for this summer – Jal jeera recipe with step by step pictures and a video. Do try it and enjoy ! Dry roast cumin seeds in a hot kadai for one minute. Do not burn the jeera. It tastes bitter and spoils the taste of jaljeera. Take all the ingredients given in the list in a mixie jar. Add the roasted cumin seeds. Grind to a smooth paste adding required water. I used 1/2 cup water to grind it. Transfer the ground paste to a bowl and wash the mixie jar with one cup of water. Add the washed water to the paste. Place another bowl, keep a metal strainer and filter the drink. Press it with a spoon to filter well and discard the residue. Add 1.5 - 2 cups more water and mix well. Check for taste and add more salt, sugar or lemon juice if needed. If you need more cumin flavor, add 1/2 tsp readymade cumin powder if u have in hand. To serve : Take a tall glass, add some crushed ice or ice cubes, top it with 2 tsp of kara boondhi and pour the jaljeera till the rim. sprinkle a pinch of cumin powder if u wish. Serve immediately. Refrigerate the remaining drink for later use. Stays fresh for 2-3 days in refrigerator. You can add more black salt, amchoor powder , sugar and lemon juice at anytime after making the drink. Adjust them based on your taste. Jaljeera tastes the best when its served chilled. 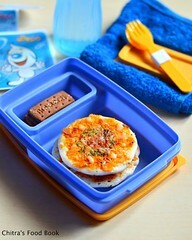 So always use ice cold water for preparation or refrigerate it / add ice cubes while serving ! 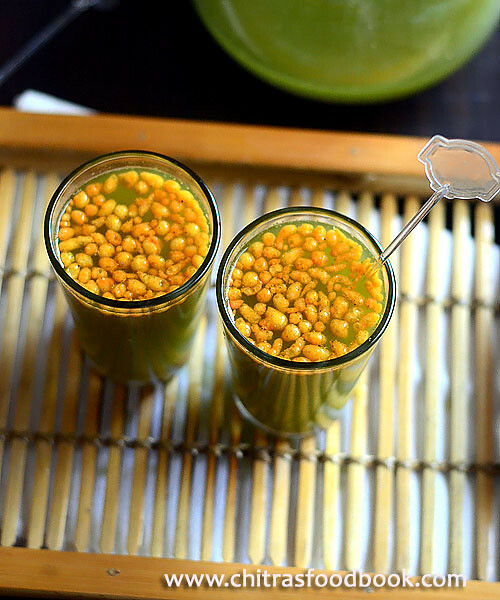 Never try this recipe without black salt and chat masala or amchoor powder.It adds a unique taste to this drink. Try this easy drink at home and have it after or before a heavy meal. It helps to improve digestion and increases appetite ! 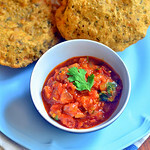 How to make tomato sabji in a pressure cooker - Easy & quick side dish for poori and roti/chapathi ! Wash and chop the onion and tomato into small pieces. In a cooker base, heat oil and splutter cumin seeds. Saute onion until transparent and then add ginger-garlic paste and curry leaves. Saute till the raw smell of g&g paste goes off. Now add the tomato pieces and saute for a minute. Add salt, turmeric powder, sugar, red chilli powder, Dhania powder, garam masala powder and saute till tomato turns mushy. Now add 3/4 cup of water, mix well and pressure cook in high flame for 2 whistles. Open the cooker after the steam is released. Oil would float on top. Mix well with a ladle and garnish with chopped coriander leaves. Boil for few minutes if the sabji is watery. Make it thick. 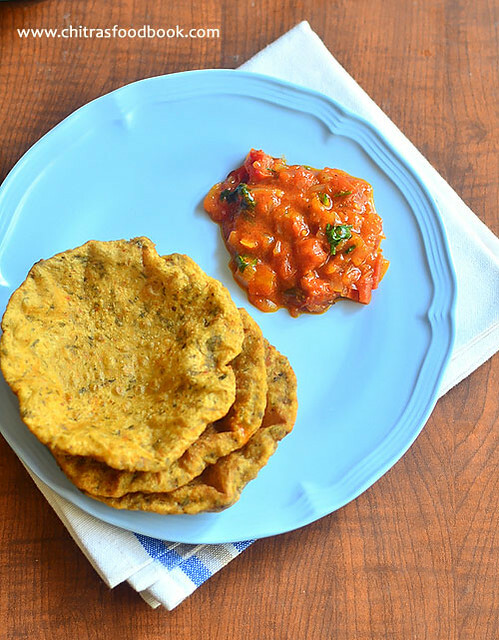 Serve hot with poori or roti ! For variations, you can add equal quantity of tomato and onion but adjust the quantity of spice powders accordingly. You can also add some cooked peas or boiled potato cubes. You can skip dhania powder if u wish. But flavor varies. Adding sugar helps to enhance the taste. It gives a mild sweetness to the bhaji. You can also make this sabji in a kadai instead of pressure cooker. 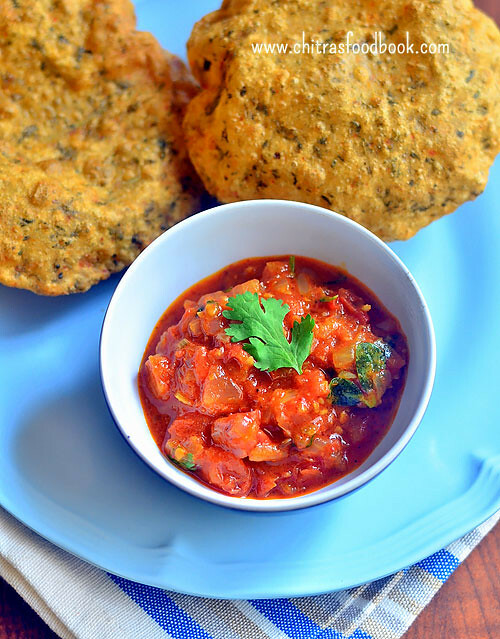 Try this easy, yummy tomato sabji at home and enjoy !! I must thank my reader friend Harini for requesting me to try Chennai Ganga sweets shop style coconut burfi with khoya ( Thengai burfi in Tamil, Nariyal Ki burfi in Hindi). When she told me, I had no clue about its taste and texture. Recently I bought that coconut burfi from Ganga sweets during my Chennai trip. When I tasted it, I found the barfi is made with coconut and khoya. 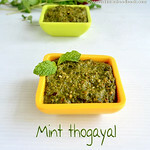 I browsed for the recipe and tried it by watching Dr.Shalini’s YouTube video. Even though its my first attempt, I am quiet happy with the results.I won’t say it came out 100% close to the sweet shop ones but it tasted similar. Usually South Indian coconut burfi is made by cooking freshly scraped coconut in sugar syrup of one string consistency. But this coconut burfi with khoya is prepared by cooking khoya/mawa, desiccated coconut, sugar and water together till it reaches the burfi consistency. You don’t have to check for one string sugar syrup. But this burfi takes long time to cook and set as it has khoya in it. I have not used milk, milk powder or condensed milk in this recipe as I had used yellow food color to resemble the sweet shop burfi. If you want to make white colored coconut burfi, use milk instead of water. I am happy that I could try this North Indian style nariyal ki burfi successfully at home. I am sharing this colorful recipe as my contribution for Holi festival 2017 . Do try this easy and yummy coconut mawa burfi at home for this festival and have a great celebration . 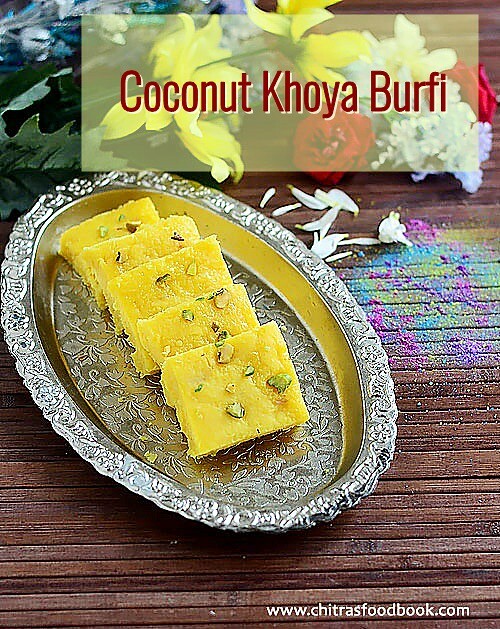 Lets see how to make coconut khoya burfi with step by step photos and a VIDEO ! Do check out my Holi special recipes COLLECTION for more sweets and snacks ideas! Elephant Yam ( Also known as Elephant foot yam in English, Senai kizhangu in Tamil, Chena in Malayalam, Suran/ Jimikand in Hindi) is a tuberous vegetable which has lots of amazing health benefits. It helps to reduce bad cholesterol, reduces hypertension, good for piles, controls diabetes, balances hormones, rich in anti oxidants etc. I am a big fan of yam chops/ Senai kizhangu roast that is made in dosa tawa. I have tried so many recipes but nothing was like the one I had in a marriage feast. I will share that recipe once I get it perfect. 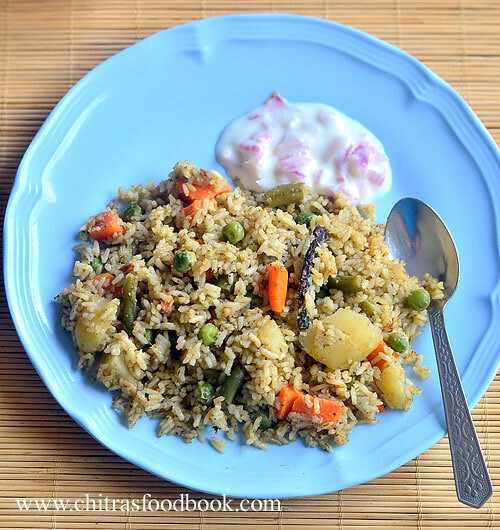 Today’s recipe is a very simple South Indian style Yam fry/ Poriyal recipe for rice that is usually made in my house. I learnt this recipe from my MIL. Generally Yam creates an itchiness in the tongue after eating. To avoid this, my MIL adds tamarind while cooking yam. 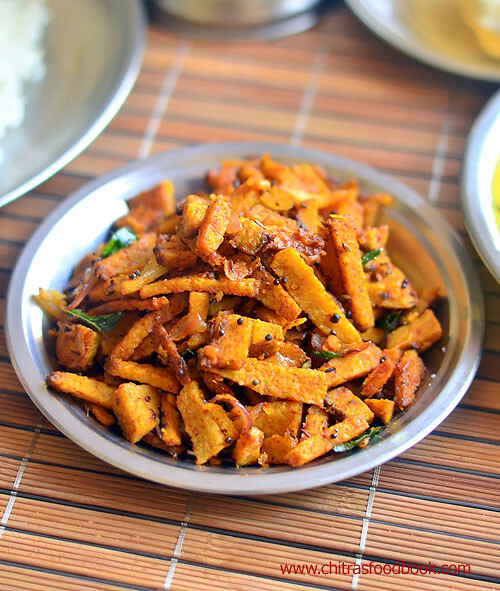 It helps to reduce the itchy feeling to some extent.Last month I made this yam fry as a side dish for Instant more kuzhambu. It was a nice combo and tasted good. 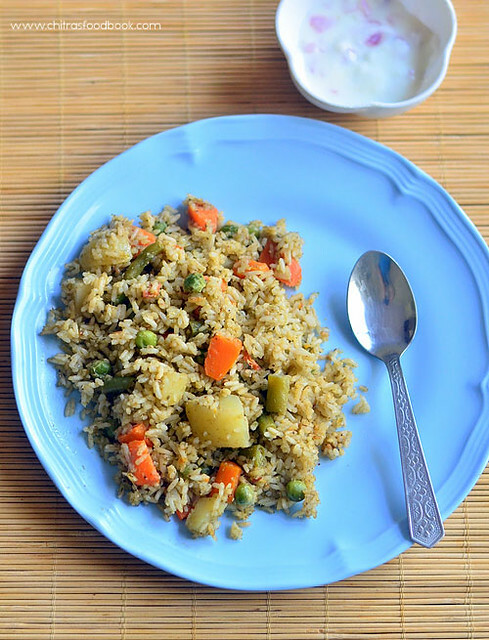 Do try this easy senai kizhangu fry at home and share your feedback with me. 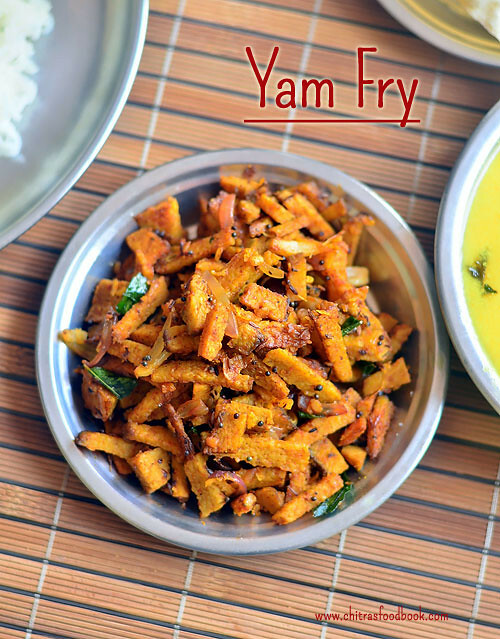 I am planning to try more yam recipes like varuval, masiyal, kuzhambu , roast etc.Stay tuned ! 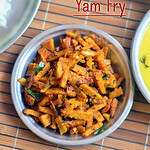 Now lets see how to make Elephant Yam Fry recipe with step by step pictures ! Cut the yam into big slices. Peel its skin and discard the skin.Chop the yam into small cubes or thin 1 inch strips as I did. 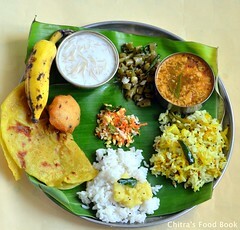 I chopped it like this after tasting this poriyal in a hotel. Soak small gooseberry size tamarind and take extract using 1/4 cup water. In a pressure cooker base, take the chopped yam, turmeric powder, salt and 1/4 cup thin tamarind extract. Mix well and pressure cook in high flame for just 2 whistles. Over cooking makes the yam mushy. Adding more water while cooking also makes it mushy. So take care while cooking. You can also cook the yam in a kadai or bowl instead. Open the cooker after the steam is released. Mix well and drain the excess water if any. Heat oil in a kadai, splutter mustard seeds, urad dal, cumin seeds and curry leaves. Saute onions till transparent. Add the cooked yam pieces, sambar powder and mix well for few minutes. Mix well till raw smell goes off. Lastly garnish with grated coconut. Mix well and switch off the flame . 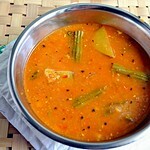 Serve hot with sambar or more kuzhambu.Tastes yum ! 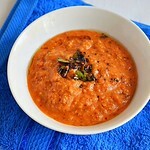 For masala flavor, you can add 1/2 tsp of garam masala powder or fennel seeds powder along with sambar powder. If you wish, you can use lemon juice after switching off the flame and skip tamarind. In that case, cook the yam pieces with plain water. Yam cooks quickly.So pressure cook it only in high flame adding very less water for just 2 whistles else it will be mashed. 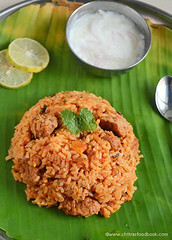 Easy, healthy Elephant Yam poriyal is ready to serve with rice ! 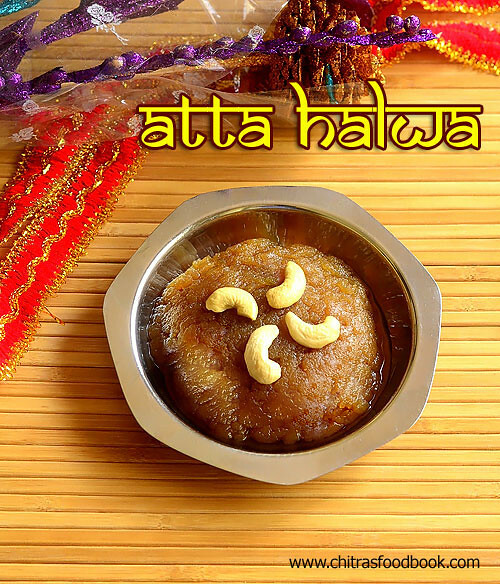 Atta halwa also known as Atta ka sheera is one of the most popular sweet/ dessert recipe in North India. This is an Instant halwa made with whole wheat flour( atta in Hindi). This atte ka halwa is served as Kadah prasad ( Karah prashad) to all the visitors of Gurudwara ( A place of worship for Sikhs ) in Punjab. 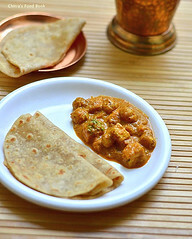 Traditionally, it is prepared with equal quantity of Whole wheat flour, Sugar and Butter/ghee to emphasize everyone are equal. Some people make this halwa adding equal quantity of wheat flour and sooji. For variations, this halwa can be made with milk or jaggery instead of sugar. I never thought making this North Indian style wheat flour halwa is so easy. 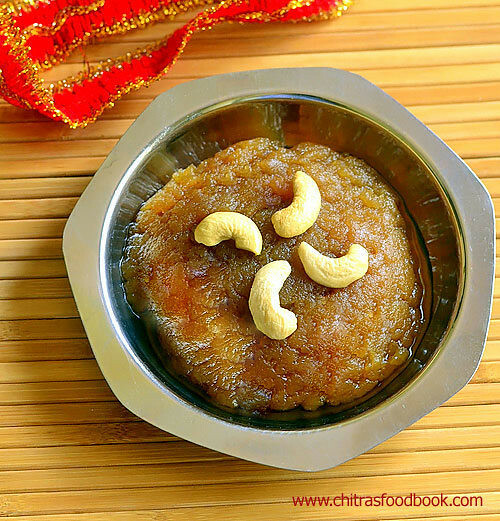 South Indian style Godhumai halwa/wheat flour halwa ( Tirunelveli halwa) is in no way related to this atta halwa in preparation and cooking procedure. Both has its own variations and taste. This sweet can be prepared easily and instantly for surprise guest and to celebrate special occasions at home. 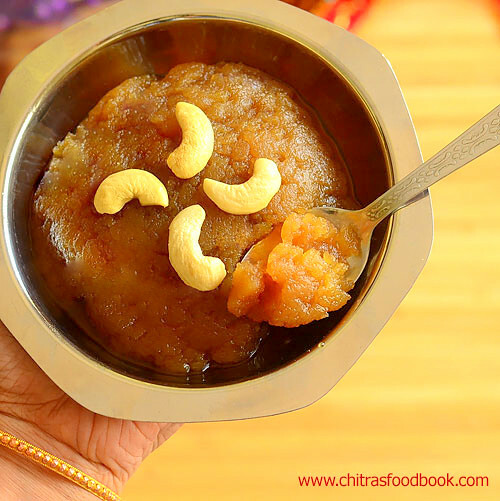 I am sure this ghee dripping halwa gets a big applause from your family members and friends. I followed the recipe from HERE and watched some You tube video recipes too. Even though its my first attempt, making this halwa was a breeze for me. You can easily find the correct stage of removing the halwa. Its 100% a beginners recipe. This halwa tastes very soft and it slides in your mouth . I made in very less quantity just to serve 2 people as the quantity of ghee is more .Holi festival is fast approaching. Include this easy, rich atta ka halwa in your menu and enjoy the festival ! 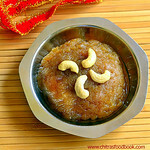 This atta halwa can also be prepared for babies but its made without ghee. I will share that recipe later.Now lets see how to make Instant, easy wheat flour halwa/ atta halwa with step by step pictures and a video ! Check out my Sooji halwa and Bread halwa recipes too. Heat 1/4 cup of ghee in a wide, non-sticky kadai. Add wheat flour and roast till it turns golden brown in color with nice aroma. Keep the flame low to medium while roasting and keep mixing to prevent burnt bottom. It takes 3- 5 minutes to roast well based on the quantity you use. Boil 1/2 cup of water in a bowl and add the hot water carefully to the roasted wheat flour. It splashes. Add 1/4 cup (heaped) sugar, cardamom powder ( I din’t use) and mix well without any lumps. All the water would be absorbed by the wheat flour and gets cooked. Mix well till halwa leaves the sides completely, becomes a whole mass. Do not switch off the stove. Keep mixing till ghee starts to ooze out in the sides of kadai. It will turn glossy too. Do the whole procedure in medium flame. It takes just 3-5 minutes to release the ghee. Switch off the flame and remove in a plate or bowl. Serve warm or cold as you wish. Please watch the video for clear understanding ! For variations, you can add milk instead of water. 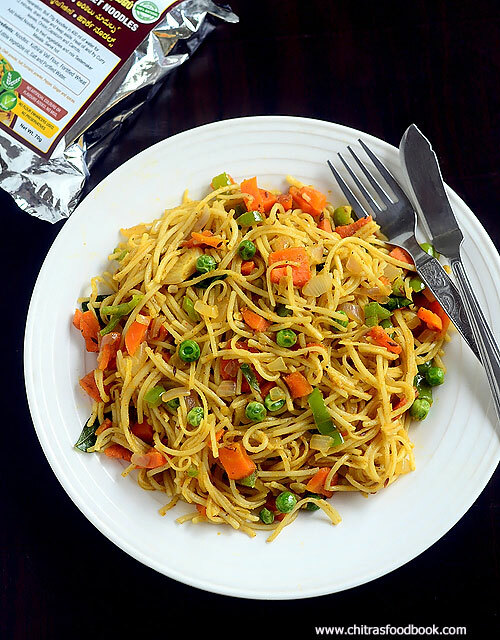 You can also use grated jaggery in place of sugar. Enjoy ! Traditionally this halwa is prepared with equal quantity of wheat flour, sugar and ghee. But I used little more sugar ( 1.25 cups) as we are sweet toothed. If you don’t want to use equal quantity of ghee, you can use half the quantity mentioned. But texture may slightly vary. Cardamom powder is not used in the traditional atta halwa. If you wish, u can add it along with sugar. If you feel the sweetness is less, you can add it even at the end. Heat the halwa till the sugar melts and ghee oozes out. Serve it warm. I read people have this halwa as a side dish for poori too just like suji ka halwa. Try and enjoy this easy, yummy, rich wheat flour halwa at home ! 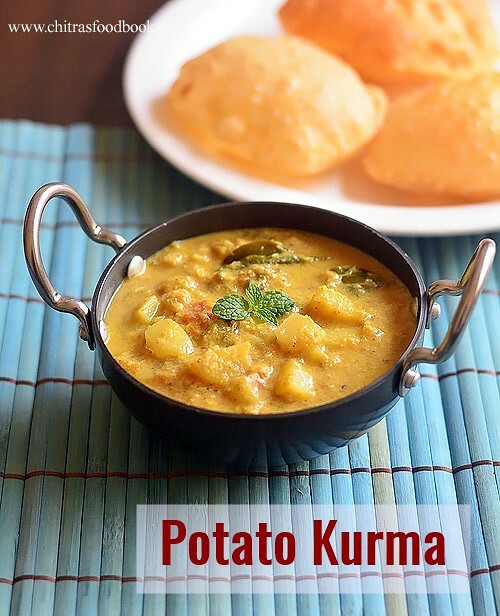 Potato kurma @ Aloo kurma is a delicious South Indian style side dish for chapathi and poori, dosa too. 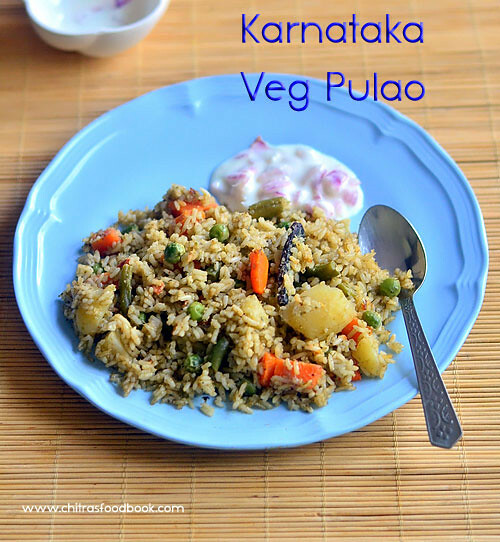 Many readers who had tried my Saravana bhavan style veg kurma requested me to share potato kurma recipe. 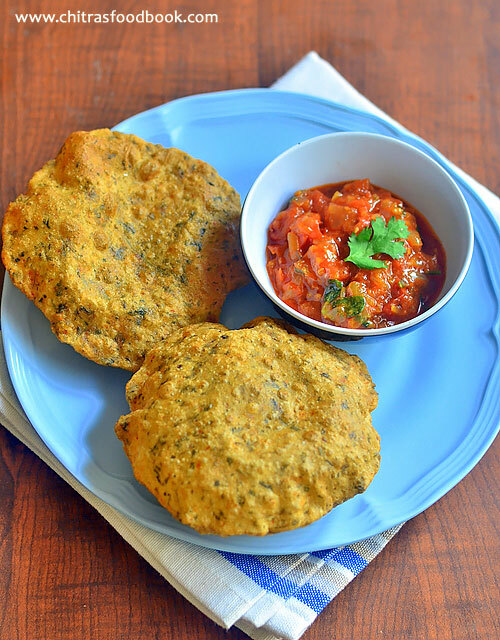 Usually in Tamil nadu, Potato masala is the most common side dish for poori. Its our family favorite too. So most of the time, I make urulaikizhangu masala. But sometimes I make this potato gravy for chapathi. 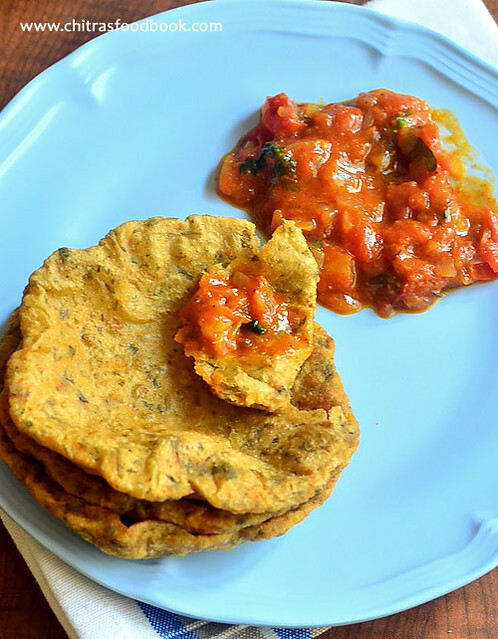 Last weekend I made puri along with this kurma for our breakfast just for posting this recipe in my space.Its a very simple South Indian style potato kurma that can be made easily in a pressure cooker. We all love this a lot. I personally like to have potato kurma with dosa as well. 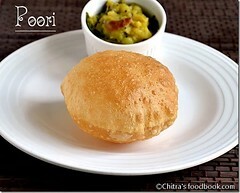 Friends, do try this easy yet yummy side dish for poori and share your feedback with me. 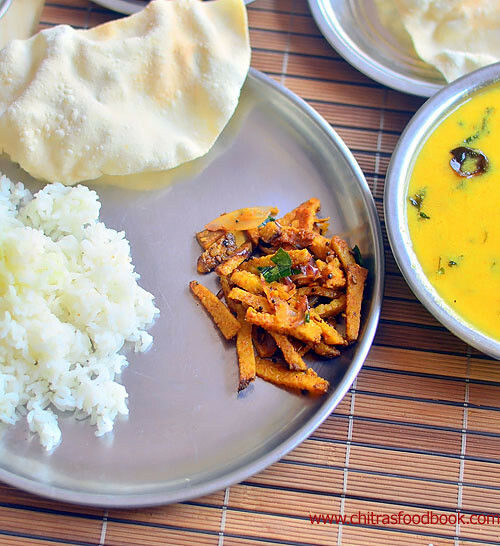 If you are looking for a no grind potato kurma without coconut, do check out this recipe. Its a very old post.So pictures are not that good. Soon I will try to update that post with a video. 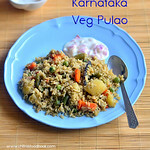 Now lets see how to make this South Indian Potato kurma for poori and chapathi with step by step pictures and video !